Bauman, who was born 1893, came early to film. During the glory days of Swedish silent cinema he worked as a translator of intertitles for foreign films into Swedish, and in 1929 he started a production company, Europa Film, together with the brothers Scheutz. In 1931 he wrote and produced Kärlek och landstorm (Love and the Home Guard), initially directed by John Lindlöf, whom Bauman replaced. In 1933 he directed his first film from scratch, Lördagskvällar (Saturday Nights). He then had a steady output, writing and directing one to two films a year. In 1939 he started yet another production/distribution company, AB Sandrew-Bauman Film, together with Anders Sandrew and continued to write and direct with the same frequency. His career lasted until 1957, when ill health forced him into retirement. Today he is not given much attention but he was an accomplished director, especially in directing actors, and with a good ear for dialogue. Bergman once said about Bauman that "If I had managed to create just one metre of his humane, intimate and culturally sane Swedish comedies I would cry with joy." The best of Bauman's films were made in the 30s and notable titles besides The Two of Us are Flickorna från Gamla Sta'n (1934 The Girls in the Old Town), a comedy about artists and the working class, Career (Karriär, 1938), about aspiring theatre actors, and Wanted (Efterlyst, 1939), about the lives and loves of three young women. This was when Bauman was at his peak, artistically, and in those years he actually resembles Jean Renoir, using long takes and deep focus to show the lives of ordinary people, often artistic, and being more interested in the intimate details than the dramatic events. Although not a filmmaker or artist on the same level as Renoir, the comparison is there to be made, in style and tone. Both Career and The Two of Us are reminiscent of films that Hasse Ekman would eventually make, and Bauman and Ekman worked closely together on several films. The most famous and most successful was Swing it, magistern! (1940, Swing It, Mr Teacher!) which Bauman and Ekman wrote the script for and Bauman directed. It is about the conflict brought about when a young girl (played by Alice Babs) tries to introduce jazz at her old-fashioned school. Here is a clip from the film, a nightclub scene with the girl singing a sad song (a song made famous more recently by Robyn). In the last 10 years of his career Bauman primarily made comedies with the actress Sickan Carlsson. She was one of Sweden's biggest stars at the time and the type she specialised in was the sturdy and self-sufficient woman, who, although not immune to romance, had a more professional approach to love and life. In a way Carlsson was like a Swedish version of Doris Day. She and Bauman made nine films together between 1945 and 1955. Bauman had had a few weak years during the war but it could be said that he was rejuvenated by working with Carlsson, and the films were commercially successful. The critics were somewhat torn though, even if they all agreed that Sickan Carlsson was sensational, a brilliant actress and a brilliant comedienne. The Bauman/Carlsson films were almost their own genre and while not as good as the films Bauman made in the late 30s they are funny, sweet and made with a light touch. So Bauman's importance for Swedish cinema was substantial, as a producer, writer and director, and as an influence on Bergman and Ekman. When Bauman quit filmmaking in 1957 Ekman stepped in as Sickan Carlsson's director and they made a number of films together. But that is a story for another post. Whenever a well-known book becomes a film the world is suddenly filled with experts on the source, and more often then not they do not know what they are talking about. I sometimes feel that filmmakers show more fidelity to the novels than critics who complain about alleged detours and changes. The same is true for The Great Gatsby. A personal favourite is an article in which the writer complained that they had changed the ending since Gatsby does not kill himself. [Spoiler alert, he does not kill himself in the book either, at least not in the versions I have read.] Yet whether any changes have been made is more or less immaterial, unless you do a compare and contrast study, specifically looking for the things that have been removed and added. The only thing that matters when evaluating the quality of the film is whether it is any good on its own, not how closely it follows the original work, a topic I have elaborated on earlier here. To focus on the film, I liked it a lot. This was primarily because of Leo DiCaprio and Carey Mulligan. The film has mainly be described as an extravagant party zone but I was pleasantly surprised by how sweet it often was, and it was when these two, Jay Gatsby and Daisy Buchanan, were together. They have an awkward date, drinking tea in a sea of flowers, and afterwards Gatsby take her on a tour of his majestic house. This was probably the highlight of the film, where the visual flourishes of Baz Luhrmann was held in check. Here the night really was tender. But it was not just that sequence, from start to finish I thought DiCaprio was excellent and convincing. It has been a long time since I saw an actor carry a film to such a degree as DiCaprio does here. It was a shame that Tobey Maguire, as Nick, was not his equal, but rather made the screen unbalanced when they had scenes together. With Mulligan the balance was just right. The other actors, although good, did not make much of an impression because the film, more than the book, was all about these three characters, Gatsby, Daisy and Nick. The first 20 minutes or so of the film were rather annoying, because they were so forced and frenetic, with people screaming rather than speaking. Then things settled down, including the characters, and it was easier to enjoy the film. There was just one thing that got in the way. Nick's voice-over, which nearly ruined several scenes because it was so superfluous. It explained the scene for us, what we were seeing, and it was always unnecessary, not to say insulting. Apparently Luhrmann have very little regard for the emotional intelligence of the audience. But it was not so bad that I was not able to enjoy the film, all the way to the beautiful last scene. Films are moving images and often a single image needs the context of the images that come before and after to be meaningful. But sometimes they can stand alone. The image is sufficiently expressive and does not need to be further understood, or it is visually beautiful, and needs no explanations. Some makes you want to enlarge them and hang them up on the wall. "An image, frozen in time" is where I take a particular still image, one that I happen to like, and write about it, in just a few words. The first one is connected to last week's post about Jacques Tourneur as it is from his Out of the Past (1947). It was hard to chose a specific image from that incredibly rich and beautiful film so I might do more but this is for today. The stars of the film are Robert Mitchum, Jane Greer and Kirk Douglas, but the part played by Virginia Huston is equally memorable. She plays Ann, the girlfriend of Jeff (played by Mitchum) and in some ways she is the real victim in the film. She is kind and sweet where the others are cynical, scheming and cruel, yet she too will lose in the end, without having done anything wrong. 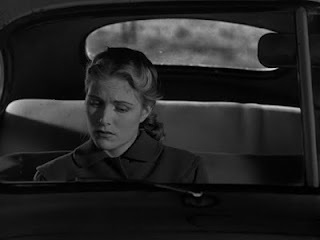 The image is from a scene in a car when Jeff reveals his past, that he is not the man Ann thinks he is, and about his previous affair with Kathie (played by Greer). Her expression is so delicate, not angry or upset, she is just pained and sad, and it is enough to make you cry. "I never saw her in the daytime. We seemed to live by night. What was left of the day went away like a pack of cigarettes you smoked. I didn't know where she lived. I never followed her. All I ever had to go on was a place and time to see her again. I don't know what we were waiting for. Maybe we thought the world would end." That is how Jeff Bailey (played by Robert Mitchum) describes his relationship with Kathie Moffat (Jane Greer) in Out of the Past (1947), and it is also a description for any number of films by Jacques Tourneur, the master of shadows and possibly the most graceful image maker there ever was. But where does imagination end and reality begin? What is this twilight, this half world of the mind that you profess to know so much about? How can we differentiate between the powers of darkness and the powers of the mind? That twilight might have been what Paul Willemen was referring to when he wrote in 1975 that "although the films dramatise the conflict between terms A/B, it is the '/' which constitutes the enigmatic pivot upon which Tourneur's films turns." And this is another line from The Curse of the Demon, spoken by the main character played (very well) by Dana Andrews: "Nobody's free from fear. I have an imagination like anyone else. It's easy to see a demon in every dark corner." Tourneur himself once said that "The real horror is to show that we all live unconsciously in fear." With these quotes most of Tourneur are more or less summed up, fear, darkness, fleeting moments and ambiguity. But it is not so much these motifs as the style in which he made them come alive that matters. There are few who has such a refined, elegant, sombre style of filmmaking, where things stay calm and controlled. It is as if the terror he unleashes is contained by the precision and beauty of each shot. The acting style in his films is subdued, sometimes almost sleepy. When directing his most common suggestion was for the actors to hold back, to quiet down. He wanted them to "lower their voice, eliminate inflections, and give the sentences a different, less dramatic rhythm." as he explained it in an interview in 1971. Of course, he did not only do horror and thrillers, he also did westerns and adventure, and even a few comedies (much to his surprise), but they were also done in the same style, and with the same evident grace and elegance. There is a case to be made for his first film in colour, Canyon Passage (1946), as being the most beautifully shot film in the whole of film history. It is a kind of western but the term does not in the least explain the power and allure of that film, which is filled with life, characters and stories, all interacting, and where the focus lies on the community rather than the individual, even though it has a central character, Logan Stuart , played by Dana Andrews. Stars in my Crown (1950) is another magnificent film about community, and also about race, racism and the Ku Klux Klan, with a great performance by Juano Hernandez, as well as Joel McCrea as the kind preacher who is the central figure in the community and the film. It shares with the best of Tourneur the same grace and beauty, this strange quality of the images which is distinctly his. During the 1940s he hardly ever faltered, with his three supernatural films Cat People (1942), I Walked With a Zombie (1943), The Leopard Man (1943) and the thriller Berlin Express (1948) being the high points together with Canyon Passage and Out of the Past. The 50s are more uneven, but with at least two sublime films, i.e. Stars of My Crown and The Curse of the Demon. After that things got difficult for him, and he mainly worked in TV, and I have seen very little of that. I want to see everything though, because Tourneur has such immense powers that even if he only manages to get one shot right in an entire film, it will still be worth it. There are two things here, first the beauty of the colours and the shadows and second the ambiguity. Did she see a man, or did she just imagine him? 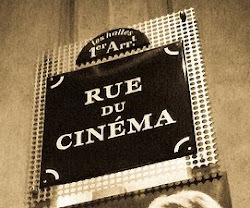 It is exactly this that is at the heart of Tourneur's art, shadows and ambiguity, the zone between the real and the unreal, the art of the uncanny. It is well-known that Ingmar Bergman was a cinephile, and he watched films on a daily basis. After he moved to Fårö, far from the cinemas of the big city, he had his own cinema were he received prints of all films that were released in Sweden, and where he had his own archive of films on tape, 16mm prints and 35mm prints. Here is another one, called "Bergman's 20th century", made in order to celebrate Swedish cinema at the turn of the millennium at Göteborg International Film Festival. It is 35 Swedish films Bergman considered to be particularly good. Notice that the list above has Raven's End by Widerberg whereas this list has Widerberg's Elvira Madigan instead. The list is certainly not the last word on which 35 films to watch, and my own 35 titles would be different, but for newcomers to non-Bergman Swedish films it is a good place to start. But avoid Ett brott / A Crime, a really bad film. 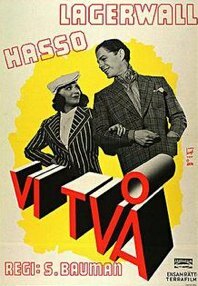 1940 was a good year in Swedish cinema, but Ett brott is not a reason why. Beware that this post discuss important plot points, including the ending of the film. Oblivion is the kind of film which it is easy to criticise, or even ridicule, for its obvious nods to earlier films, its many illustrious precursors from which has borrowed this and that. I said something myself to that effect on twitter. But then I thought better of it because there is nothing wrong with showing awareness of the history of the film one is making, and since it is easy to imagine Joseph Kosinski (who came up with the idea for Oblivion and also directed it) having been in love with science fiction since he was a little boy and now, when in a position to make his own contributions, he wants to acknowledge that. Most films borrow heavily from what has come before, but it is particularly transparent with films like this. Since I really liked Oblivion I see no reason to quibble about it and will instead focus on the good things. It was well-paced, sharp and focused, with the humour thankfully kept to a minimum (without being self-important) and with spectacular visuals. It was a treat for the eyes. I also liked the importance of art in the film; books, music and paintings. We need art /.../ to help explain life to us, to show us meanings, to illuminate the relationship between the life that each of us embodies and the life outside us. We need art most, perhaps, to reassure us of our own humanity. which is actually exactly how it works in Oblivion. The two main characters, Jack (Tom Cruise) and Victoria (Andrea Riseborough) are not humans, they are clones, but this is not apparent. There are two things that makes Jack in particular human. First his memories. Victoria is less human because she has no memories, but Jack has the same sensibilities and (repressed) memories* as his origin, the ur-Jack. The other thing is his interest in art. When he finds a book he picks it up and reads it. He listens to music, he saves paintings. Through art his humanity is reassured, and consequently life on earth. But does this make all his clones equally human, as human as the first Jack, the original. The ending of the film puts this in sharp relief, whether intentional or not. When "our" Jack is killed in the end, and a new Jack appears, is there a difference between the two? The film seems to suggest that they are the same. One thing I was wondering as I watched the film was whether Kosinski or anyone else ever thought of switching the gender roles. Now the woman is staying at home, watching a computer, while the man is out and about, fighting and repairing drones. There is no reason why it could not have been the other way around, no reason except traditionalism or possibly sexism. Having the man at home and the woman out on the field would have made the film more original than it is now, and more fun. (Or having women in both parts.) Maybe they thought about it, but felt that it would damage the film's financial success. If so, was that an accurate assumption? I do not know. Something I do know however is that there was a ridiculous mistake towards the end, a mistake made by the humans who were hiding underground. When they were ready to go off to the final battle they opened the door to their cave and was immediately attacked by the drones waiting outside. What kind of madness was that? They have lived in mortal fear of these drones for 60 years, but now, when they are about to strike back, they seem to have forgotten all about them. Why did they not, for example, open a peephole, for a look outside first? I understand that the filmmakers wanted to have an attack but it could have been handled in many different ways so as to remain plausible (for example by having the drones hiding and not appearing until it was too late for the rebellious forces to spot them). Such unnecessary silliness is something that is all to common in films, and it can only be explained by laziness on the part of the filmmakers. It is not there because the genre demands it, and it is not there because the story demands it. And it is not me being silly for questioning such a thing in what is after all a science fiction film. I am only asking the film to adhere to its own laws, its own reality, which is that these fighters would not go out without making sure it was safe to do so. It is a small thing, but I get annoyed because it is so common and so unnecessary. But even so, Oblivion remains one of the highlights so far this year. *Our memories are for me a key aspect of what makes us human, and that defines who we are as individuals. We are, partly, what we remember.